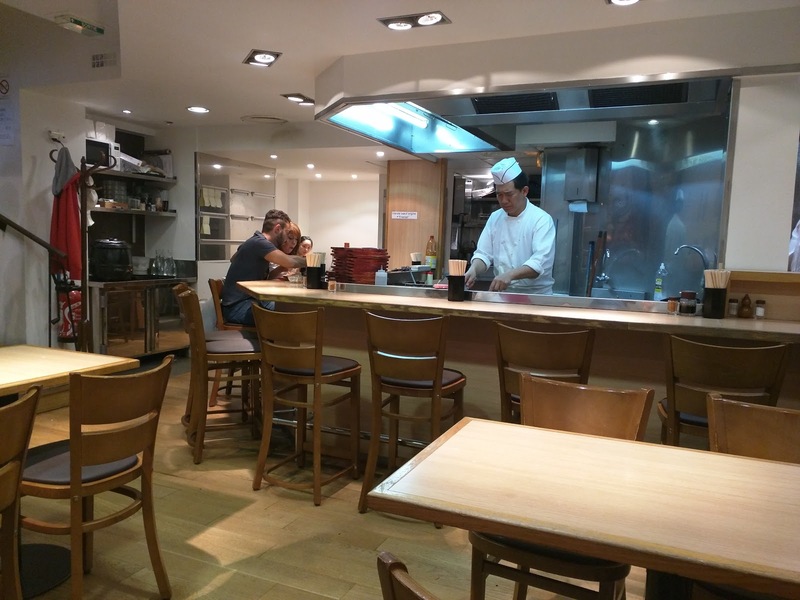 When in Paris, go get ... okonomiyaki? Yes, I know this sounds like a very odd choice. But early on our trip to Paris, Ojan and I went to L'Atelier de Joël Robuchon for a epic 2 Michelin star lunch, large, and very rich. We spent the afternoon playing tourist, checking out a bunch of sights as we meandered back to our hotel. By the time dinner time rolled around, we had no energy left. We were still stuffed from Joël Robuchon. We didn't have it in us to sit through a long meal. We didn't want to go far. So I consulted my list, and Aki Restaurant jumped out. A recommendation from a friend, which I had cross-referenced on Yelp and TripAdvisor. A Japanese place, in "little tokyo", only a 5 minute walk from our hotel, known for the okonomiyaki. Now, you may recall the last, rather unfortunate, run-in I had with okonomiyaki at President Chibo in Tokyo. Yup, I got food poisoning, and the wrong order on top of that. But the chefs at my office made okonomiyaki once for us since then, and I loved it. I mean, I don't actually love the pancake base very much, but the sweet sauce and the creamy mayo on top? Um, yes. 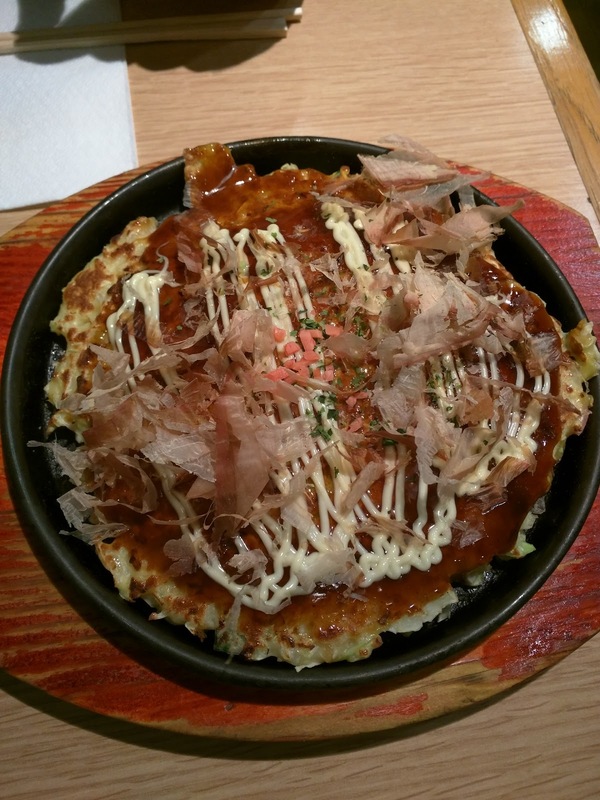 Plus, Ojan had never had real okonomiyaki before, and I wanted him to experience it. So, Aki Restaurant fit the bill: unique, close by, casual, and easy to split something fairly small, since neither of us were that hungry? Sounded good. Aki was pretty much what I expected. Simple. Two levels, with the upstairs mostly specializing in soba dishes, and downstairs okonomiyaki, although you could order either in both locations. Decor was basic: wooden tables, wooden chairs, cheap wooden chopsticks on the tables, a single paper napkin each. The tables weren't really clean, ours was sticky. I cringed when the server put the okonomiyaki cutter down on it directly. Okonomiyaki orders were all prepared on the teppan, in the open area on the other side of the room. 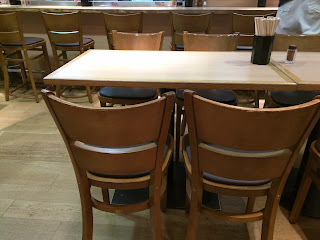 We weren't seated at the counter, so we couldn't watch the action directly, but that was fine. We were too exhausted to interact. We started with an order of takuwan, just to have something to nibble on. It was sprinkled with sesame seeds. It was fine, nicely crunchy and fresh enough, but the flavor was more bitter than I'm used to. €3.70 seemed a bit high for just a small plate of takuwan. It arrived after about 15 minutes, expected since it was cooked to order. Served piping hot. From an initial glance, I was sad. It was much smaller than I expected, although that was fine, since we really weren't hungry, we were mostly eating because we were "supposed to". But it also didn't have nearly enough sauce and mayo on it. The sauces are WHY I get okonomiyaki! But, once I took a bite, I no longer minded that. I really, really didn't like the sauces. The sweet sauce just wasn't very sweet, and had a really strange flavor to it. I can't explain it. I just didn't like it. The mayo tasted like totally generic mayo. 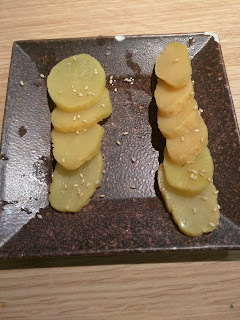 These toppings are where the magic of okonomiyaki are for me! I still tried to like it. The base pancake was fine, loaded with chunks of soft, flavorful cabbage. But it wasn't very crispy. The best part was the calamari, actually nicely cooked, tender, soft, not chewy. But given the lackluster pancake, and the toppings that neither Ojan nor I could stand, this just wasn't a winner. I think I'm still glad we went though, as it fed us easily, and for cheap (needed after Michelin star lunch!). And they have a sister boulangerie across the street, which I promptly visited as Ojan paid the bill. More on that soon.